Our team guided Mauritius’ leading grocery chain (25 outlets) in the development of their omnichannel strategy from inception. We enabled Winner’s to launch within 6 months an ecommerce channel delivering similar levels of product offering, convenience and experience that customers are accustomed to in store. This was achieved by building realistic and tailored operational, technological and organisational plans, endorsed by all key stakeholders across the business. Whilst managing the delivery of the project, we also steered the ecommerce operations set up. From product catalogue definition through to in-store order management and customer service, our team ensured synergy at all times between system capabilities, people and processes. Throughout the duration of the project, our consultants were onsite in Mauritius, working alongside the Winner’s team, advising and mentoring them on a daily basis. We defined the required organisational changes and recruitments. Our consultants established a ‘train the trainer’ methodology across both head office and stores, thereby ensuring that omnichannel process can be sustainably and cohesively adopted going forward. We also ensured a smooth transition from project into day-to-day trading modes and helped establish the daily routines across commercial and operational teams. We selected specialised online grocery and product data management solutions, namely Freshop and Alkemics, to implement Winner’s omnichannel roadmap. These partners were instrumental in enabling, within just 6 months, a compelling and scalable omnichannel grocery shopping experience. Our onsite consultants guided and supported Freshop and Alkemics in their daily developments to ensure a quality implementation throughout each phase. Lastly, our in-house studio delivered the design for Winner’s responsive website, whilst aligning the visual design with Winner’s rebranding exercise along the way. 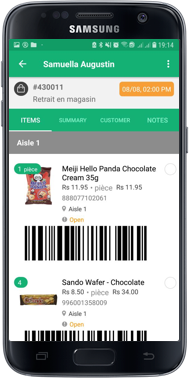 We designed a User Experience aligned to Mauritius customer expectations and that made the most of Freshop’s core capabilities. 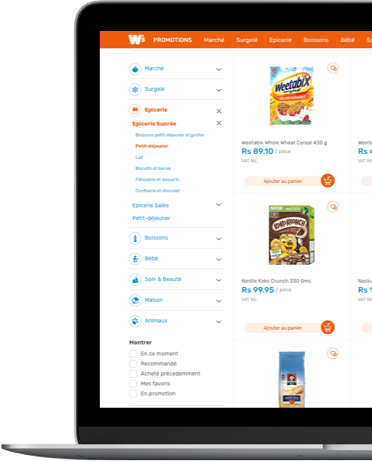 Freshop (U.S.) is a feature-rich all-in-one SAAS online grocery solution offering a simple, powerful and customised omnichannel shopping experience. Freshop’s out-of-the-box capabilities and progressive pricing model dramatically reduces both time-to-market and project and ecommerce operations cost. 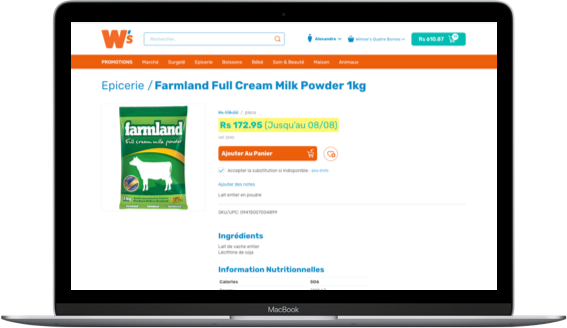 Alkemics (France) is a collaborative platform augmenting product content with data from suppliers. Alkemics accelerates time-to-market and reduces retailer workload by mutualising data contribution and management responsibility across suppliers.